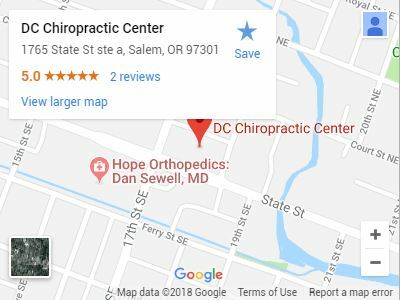 DC Chiropractic Center near Keizer, Oregon specializes in injury treatment and pain therapy through thoughtful, customized chiropractic care. Our team treats patients from auto accidents, work injuries, and sports injuries, helping them get back to healthy functioning as quickly as possible. Chiropractor Dr. Daniel O. Cook, DC has helped people from all walks of life to feel better and become pain-free including professionals, mothers, children, and even NFL athletes. DC Chiropractic Center offers full treatment for back pain, neck pain, headaches, and chronic pain. Chiropractic services are the most effective treatment for back pain, offering hope for the millions of people who develop issues from injuries, bad posture, sports, and the aging process. Wellness chiropractic can help anyone feel better, regardless of your level of pain. But it’s especially effective for patients suffering from chronic conditions, persistent aches and pains, and misalignments. As specialists for car-accident-related injuries, we know that injuries from auto collisions are notoriously difficult for the average person to pinpoint. Chiropractors can easily diagnose and alleviate pain after a crash, preventing long-term damage to soft tissue and joints. Athletes also turn to chiropractic for both sports injury treatment and sports performance enhancement. Chiropractic treatment is an excellent option for treating injuries without medication or the high cost and possible danger of surgery. However, for more serious conditions, we are more than happy to refer you to physicians, massage therapists, and other professionals who can offer additional solutions. DC Chiropractic Center is accepting new patients and will do everything possible to get you in into the office the same day if needed. Our goal is to help you start healing right away. But healing is a process. That’s why we give you tools to manage pain at home and develop a treatment plan that invovles regular visits to our office just a short drive from Keizer, Oregon. Dr. Daniel Cook and his staff have years of experience and offer treatments that encourage the body’s natural healing abilities. Treatment Techniques include cold laser therapy, gentle spinal manipulation, massage, Kinesiotape®, ultrasound, therapeutic exercise, and hot and cold therapy. If needed, Dr. Cook also works with medical doctors and physical therapists to enhance a patient’s treatment plan. We understand that every patient is different. And will take the time to understand your personal needs, condition, and treatment requirements. To help decrease pain and prevent chronic recurring pain, we encouraged you to set up an initial consultation with our chiropractor in Keizer, Oregon. You can schedule an appointment with Dr. Cook by using our appointment form or by calling DC Chiropractic Center today. We look forward to hearing from you!